A headache may appear as a sharp, steady pain on your scalp, forehead or temples. The pain may stay in one location or spread out to other areas. If you have migraines, the headache may seem like dull ache that throbs in one location. Migraine sufferers may also experience stomach upset, light sensitivity and sensitivity to sound. Medications may help relieve pain from headaches and migraines, but supplements such as ginger may also provide benefits. The zingiber plant has an edible root commonly referred to as ginger root. Although frequently used in recipes, ginger may have medicinal qualities. 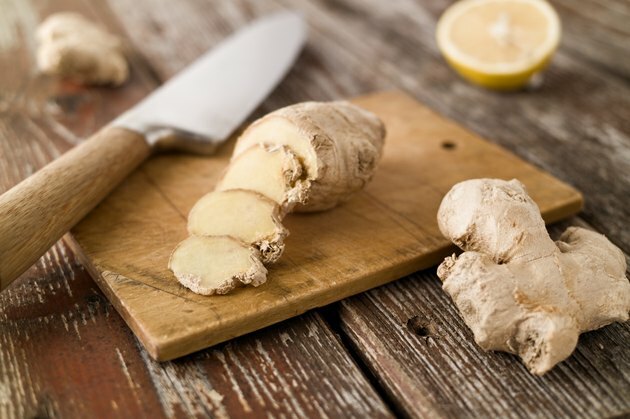 Your doctor may recommend ginger if you have nausea from motion sickness, pregnancy or other causes. Doctors may also recommend ginger to help reduce cholesterol levels and prevent cancer, reports the University of Maryland Medical Center. In addition, ginger may offer some relief for migraine sufferers. In 2011, researchers from headache clinics throughout the U.S. evaluated the use of a supplement containing ginger and feverfew in managing headaches. Feverfew is an herb often used for stomach upset, dizziness and allergies. As a part of the study, researchers used a combination of feverfew and ginger in a dissolvable tablet placed under the tongue. Migraine sufferers found that, when using the tablet at the first sign of headache, the supplement helped prevent a severe migraine. Side effects from use included mouth numbness and nausea. Over-the-counter pain relievers may help reduce your discomfort when you have a headache. If you have a severe headache or a migraine you may need to use prescription medication to control your symptoms. Recurring headaches require medical evaluation since this could indicate an underlying medical condition. In certain cases, you may need to make lifestyle changes to help control your stress levels or sleep better, and this may reduce the frequency of your headaches. You should not take ginger or other supplements without first consulting your doctor. Ginger may have a blood-thinning effect, and if you take blood thinners or have a blood disorder, this may increase your risk for bleeding. Consult your doctor if you have severe, frequent or prolonged headaches. She may ask you to keep a journal to document your headaches along with information such as diet, sleep habits and stress levels surrounding the onset. This will help her evaluate your condition and work with you to reduce headaches. What Is Ginger Ale Good For?